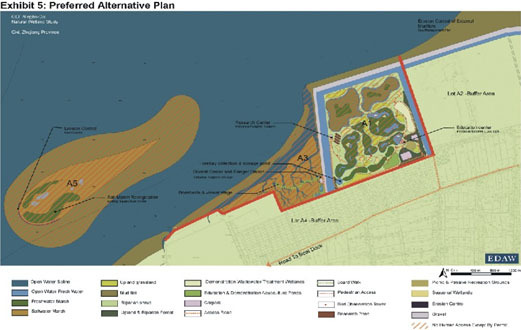 The enclosure of Plot A1 by the sea wall will be restored into freshwater wetlands through engineering approaches to act as an undisturbed roosting site for migratory birds at high tide when their feeding areas are covered, and to create habitats for wildlife and aquatic vegetation. The Environmental Education Center building will be constructed in an appropriate location to provide high quality education, research and tourism facilities for scholars, students and tourists. Plot A3 is an inter-tidal marsh outside the dike with an area of 1.4km 2. The objective for the area of A3 is to maintain its present status but adopt some management approaches to forbid aquaculture and harvesting activities, and to promote biodiversity and restore its habit value. The bulrush population is well preserved at present but there is extensive aquaculture. Plot A5 is an offshore shoal with an area of 1.8km 2 . The vegetation is well preserved with a number of species , mainly Spartina anglica which has high ecological value . There are many aquaculture ponds on the island and most of them will be removed and restored into salt marshes through regradeing and planting to build this island as a nucleus for repopulating wetland species. Human activities will be completely restricted.